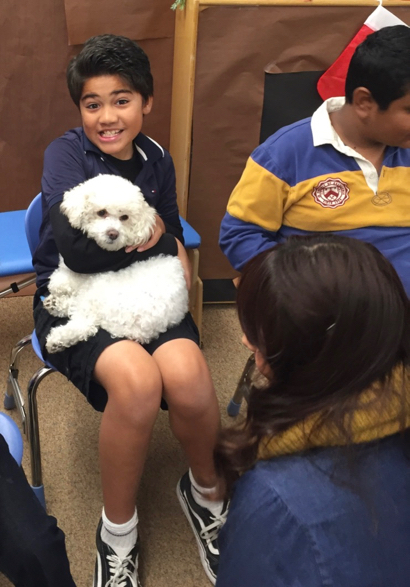 It was a very happy Monday morning yesterday in Menlo Park City School District when six-year-old poodle Minnie visited the special education program at Encinal School. Leonor Delgado and Arlene Esquivias of the Humane Society’s Animals Everywhere program brought Minnie to the classroom. Minnie is a certified therapy dog specially trained to work with medically-fragile children and has lots of experience visiting children’s hospitals. The district’s team of special education teachers and para-educators set up the visit, and the Humane Society reports that Minnie and her human friends had just as a great a time as the children. More partnerships with the Palo Alto Humane Society is in the works across the district.